It’s amazing how fast the summer is going by! Looking back thus far I think the fishing in the Ranch has been great. The big flush is over and the upper river flows have come back down to around 1000 cfs out of island park reservoir. The water has also cleared up and the fishing in my opinion has been good. P.M.Ds are coming off in the mornings and fish are looking up! A yellow #16 Hi Vis spinner has been fooling trout in the mornings and I would also have a few #16 limestone cripples and some #16 P.M.D hackle stackers. You should start to see duns between 9:00 to 10:00 in the morning. As the day progresses you may notice some ants flying around. For whatever reason trout love ants! A cdc water wasp has been working well from 12:00 until the evening spinner fall. A #16 Hi Vis Rusty Spinner has been the ticket for the evening fishing. Also don’t forget to have a good supply of hopper and beetle patters in your box of tricks. I have seen trout on the Ranch move four feet out of a feeding lane to eat a beetle. Warm River to Ashton has been fishing very well all year. The higher water didn’t even seem to affect the fishing on that stretch. Big browns were eating streamers! Mikes Woolhead Sculpin and sparkle minnows have been working well. Also a good supply of # 8 and #10 Brown Rubber Legs. Red Zebra Midges and Two Bit Hookers have also been producing. Ashton down through St Anthony has started to fish well. Hoppers on the banks and P.M.Ds in the riffles. Also caddis flies are still abundant. Having Rainy’s Hoppers and Schroders Para Hoppers in # 8, 10 and 12 is a good idea. Also Lawson’s EZ Caddis in a #14 will work. A good supply of small bead heads is always a good idea. All in all I think the Henrys Fork is fishing very well. If this weather pattern continues I think we will have a great august. Be aware that we still have open slots available in the book so give us a call and lets us show you what the Henrys Fork has to offer! The Teton River has been outstanding! This is truly an Idaho gem. The Teton meanders down through some of East Idaho’s most fertile farm ground providing water for the crops and livestock that help feed the country but more importantly it is loaded with big cutthroat and brown trout and even more exciting they love to eat dry flies! The Teton has some great hatches as well. I have seen prolific hatches of caddis on the Teton and it seems like every fish on the river in up eating them. I had a great night throwing a #14 Lawson’s EZ caddis until I could not see anymore. I lost track of how many eats I had that night. 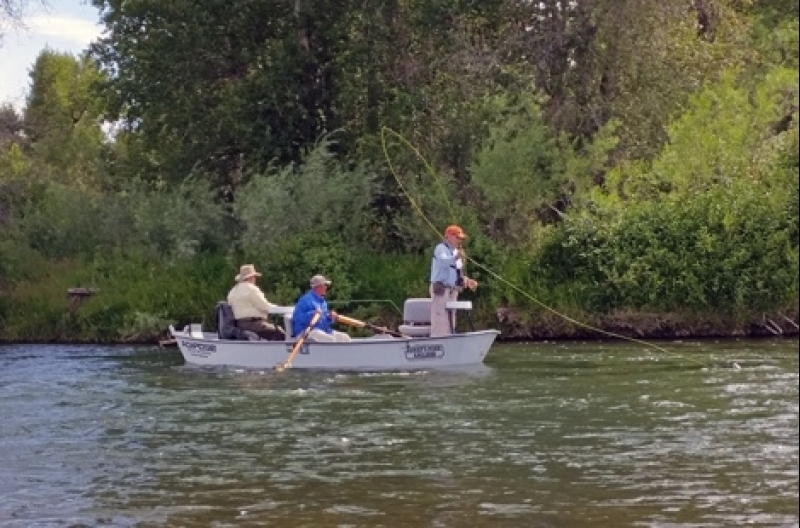 We have run several guide trips on the Teton this summer and I have seen lots of smiling faces returning to the shop. As some of you know a trout close to 30 inches was caught by a young man this summer on a guide trip out of Henrys Fork Anglers. Come in to the shop if you’re in Island Park and get some flies and advice on where to go on the river. The South Fork of the Snake continues to be great. All sections fishing very well and while the banks may have slowed down just a bit the riffles continue to fish great. The Pink Albert’s hatch daily around 9:00 am and there are always plenty of hungry Cutties ready to eat in almost every riffle. Don’t forget to check the side channels and try to get a little off the beaten as much as you can on the South Fork. Don’t let crowded boat access put you off on the South Fork, it’s a big river and can handle lots of traffic. You can always find a spot on the river. Don’t forget your streamers and if you’re fishing banks one of my all-time favorite patters in a big Para Hopper. Also pink and purple chubbys on the banks always seem to coax up large fish. Recent cool weather has really helped the fishing on the Madison. The water temperature is very favorable to trout. 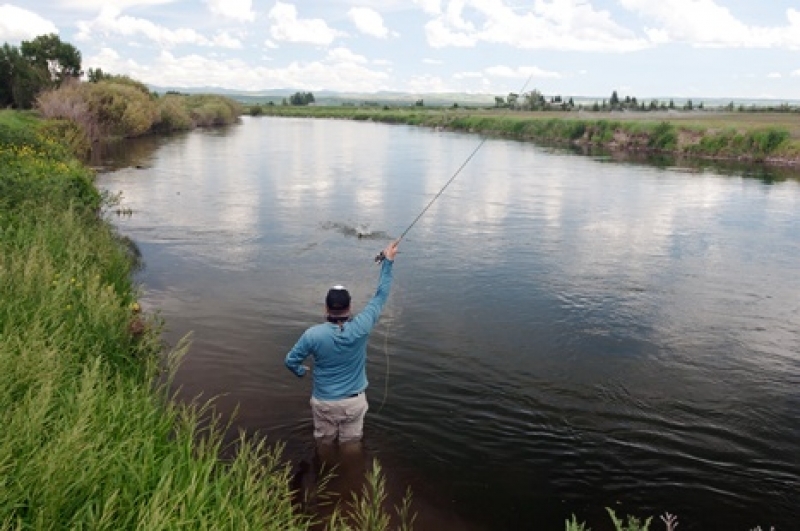 Even though the flow is below normal at just over 800 cfs fish have been holding near the banks in shallow water. A size 16 E-Z Caddis will take fish, especially during the evening hours. Hoppers, ants and beetles are also producing. Nymph fishing has been good with small rubberlegs, Zebra Nymphs, Copper Johns, and Hare’s Ear are some good choices. Also consider swinging soft hackles in the riffles. 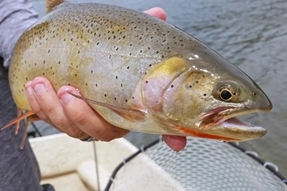 Best fishing in Yellowstone Park has been on the Lamar and Slough Creek. The Lamar gets dirty very quickly with wet weather but when it is clear it can produce fantastic fishing. There have been some good hatches of mayflies but by and large the best fishing is with terrestrials. 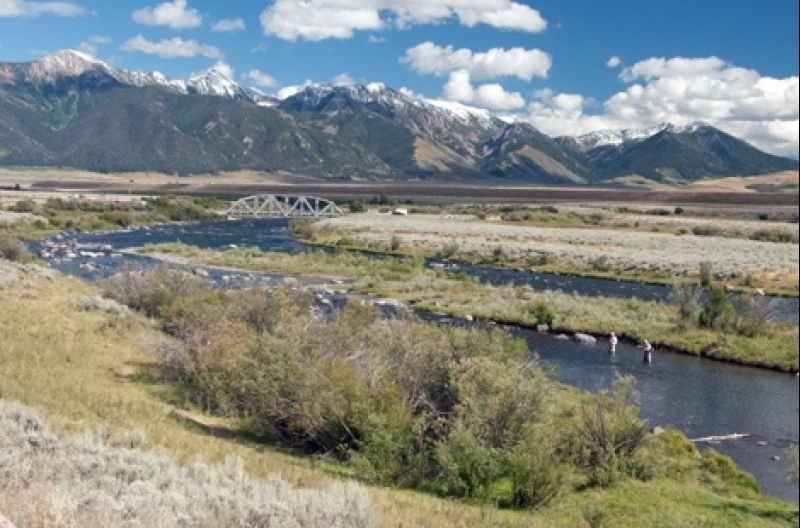 If you’re looking for a big trout try the Yellowstone between Fishing Bridge and Sulfur Caldron. You’ll need to put on the same game face as the Ranch. The trout are few and far between but if you find one there is a good chance it will be twenty inches or more. There have been some hatches to bring them up but if you can find fish rising try to spot them in the clear water.